1. Eggs. This is your best low-carb breakfast option. One egg has less than 1g of carbs. Studies showed that those who had eggs in the morning had better satiety and snacked less on unhealthy stuff at night. This is related to eggs’ protein content which reduces ghrelin, your hunger hormone. 2. Meat and Poultry. All types of meat including chicken, lamb, and beef have zero carb with the exception of organ meats like liver, which is about 5% carb. Go for lean options like chicken breast and lean beef cuts like beef sirloin. 3. Fish and Seafood. Like meat, all fish and seafood have zero carb with the exception of shellfish, which is about 5% carb. Go for white fish, salmon, and sardines. These are also rich in omega-3 fats, important for your heart, brain and joint health. 4. Asparagus and Mushroom. Pretty much all vegetables are low-carb foods with the exception of starchy root vegetables like potato, carrots, parsnips, turnips and butternut squash. Asparagus and mushroom have the least amount of carbs with less than 2% content. They’re also high in protein compared to most vegetables. 5. Cucumber. After asparagus and mushroom comes cucumber with only 4% carb content. Cucumbers are a great low calorie, quick snack for those who don’t drink enough water. 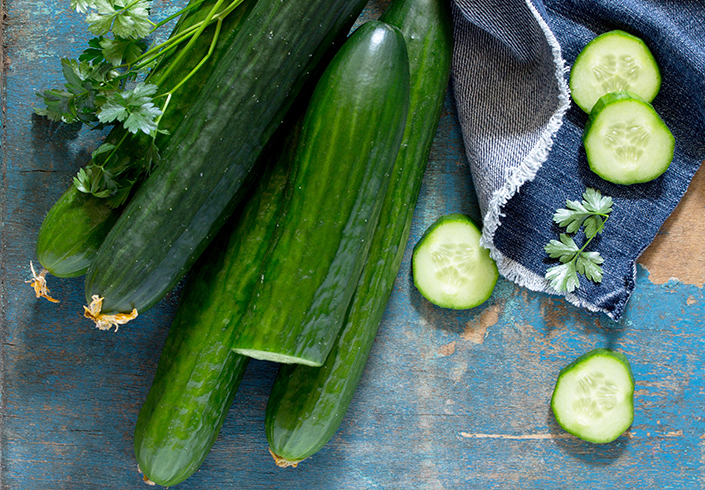 One cup has around 20 calories and 1 cucumber contains more than 95% water. 6. Cauliflower. Cauliflower provides around 5% carb content. Other low-carb vegetables are eggplant, bell peppers; broccoli, Brussels sprouts, and green beans with on average only 6 to 7% carb content. 7. Oils. All oils have zero carb. Avoid vegetable oils like canola and palm oil. These are high in trans-fats and go through a lot of processing. Instead, use olive oil, known for its content in heart-healthy monounsaturated fats. You can also use coconut oil, known for its medium chain triglyceride content, shown to have powerful effects on metabolism. Coconut oil has been shown to reduce appetite, boost fat burning, especially stubborn belly fat. Go for extra virgin coconut oil. 8. Walnuts and Pecans. Low-carb and rich in Vitamin E, fiber, and heart-protective omega fats, walnuts and pecans are a perfect snack. Both are low carb nuts with 14% carb content on average compared to almonds, cashews, and pistachios with 22 to 26% carb content. Although they’re low-carb foods, they’re high in calories so make sure you control your portions. A handful a day is more than enough. 9. Macadamia Butter. All nut butters are excellent low-carb options. They all have more or less the same amount of carbs: macadamia butter has only 2g of carbs, almond butter has 3g, peanut butter has 4g, and cashew butter has 5g. It’s also high in calories (100 kcal per tablespoon). One tablespoon is more than enough for a quick snack. 10. Dark Chocolate. Pick dark chocolate with 70 to 90% cocoa content to make sure the sugar content is low. Dark chocolate in moderation has been shown to lower blood pressure and the risk of heart disease due to its flavonoid content. Other good news is that around 25% of the carbs in dark chocolate is fiber, so the total digestible carb content is even lower. All you need is one square (10g) a day that gives you 50 calories. 11. Cheese. Among the tastiest low-carb foods, but not all cheese is created equal. Avoid processed cheese that is yellow or cream cheese. Instead, go for white options like cottage cheese, feta, and halloumi. 12. Cream. Heavy cream has only 3% carb. You can use it in low-carb dessert recipes. Try a bowl of strawberries or blueberries with whipped cream. Easy, quick and delicious healthy snack. 13. Yogurt. Yogurt is another low-carb food (5%) that you can have as a snack or for breakfast. Go for greek yogurt, it has slightly fewer carbs (4%), more protein and B vitamins. Avoid low-fat fruit options, they’re high in sugar. One serving may have up to 20g of sugar, equivalent to 4 teaspoons. 14. Avocado. Loaded with healthy fats, fiber, and potassium, half an avocado is 100 to 150 kcal and has around 7 to 10g of carbs, of which 5 to 8g is fiber. You can add it to your mains, salads or have it as a snack. You can also make dark chocolate mousse with avocado, a healthy and yummy low-carb dessert. 15. Kiwi and Watermelon. One medium kiwi and 1 cup of diced watermelon have around 10 to 11g of carbs only. These are the lowest carb fruits along with cranberries, strawberries, rockmelon and grapefruit. Santos, F. L., et al. “Systematic review and meta‐analysis of clinical trials of the effects of low carbohydrate diets on cardiovascular risk factors.” Obesity reviews 13.11 (2012): 1048-1066. Liau, Kai Ming, et al. “An open-label pilot study to assess the efficacy and safety of virgin coconut oil in reducing visceral adiposity.” ISRN pharmacology 2011 (2011). Desideri, Giovambattista, et al. “Benefits in Cognitive Function, Blood Pressure, and Insulin Resistance Through Cocoa Flavanol Consumption in Elderly Subjects With Mild Cognitive ImpairmentNovelty and Significance.” Hypertension 60.3 (2012): 794-801.